Hey Obama; A 60% Increase In NYC Homelessness; Some Legacy!! “Harvard Crushes The “Obama Recovery” Farce With 9 Simple Charts” in which we reviewed a report from Harvard Business School on the true health of the U.S. economy. Given the title, it’s probably not terribly surprising that Harvard was somewhat “underwhelmed” with the Obama recovery after taking a multi-decade look at various economic metrics like labor force participation rates, new business formation, productivity and real household income. Now, courtesy of data from the New York City Department of Homeless Services, we have a couple of additional charts to add to the list like the one below that shows a ~60% increase in the number of NYC families living in homeless shelters over the past five years. 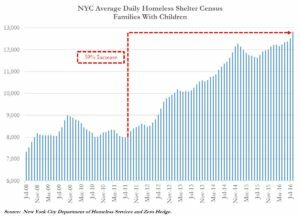 Aside from an increse during the “great recession”, the number of New York City families living in homeless shelter remained fairly constant at around 8,000 from July 2008 through July 2011. That said, over the following 5 years beginning in August 2011 through today, NYC has experienced a nearly 60% increase in the number of families living in homeless shelters to nearly 13,000. Ironically, the increase in homelessness experienced during the “great recession” was just a blip on the radar compared to the past five years as residential rental rates in NYC have soared. Alternatively, we offer up the following statistics from Mayor Bill De Blasio’s Fiscal 2016 “Mayor’s Management Report” highlighting a42% increase in applications for “Emergency Rent Assistance” from New York City families at risk of losing their housing. If this is what a “recovery” looks like to Obama we would certainly like to better understand how he would define a recession.